Over 1500 Webpages on Joan of Arc available at this website! Learn All About Joan! Get Your 2019 JOAN OF ARC PRINT NOW! CLICK HERE! "MAID OF HEAVEN WILL TAKE YOU ALONG ON AN EPIC JOURNEY AND MAKE YOU FULLY UNDERSTAND WHY JOAN OF ARC TRULY DESERVES TO BE CALLED A SAINT!" 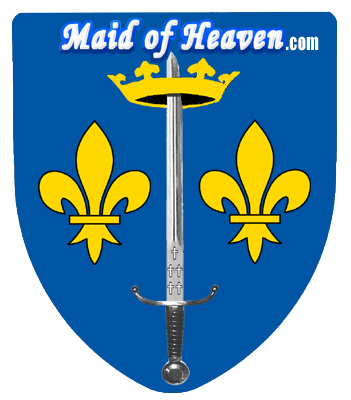 Maid of Heaven is the story of the legendary and incomparable Saint Joan of Arc. Written by Ben D. Kennedy, who has become known as the "American Poet of Freedom" for his beautiful and thought-provoking poems at PoliticalPoet.com that include public favorites like: A Place Known as America, Duty Honor Country, and Rebel Yell! In Maid of Heaven, Ben is at his very best creating a true classic about one of the greatest people in history. Beautiful historic illustrations of Joan on every page including 17 full page antique pictures. Do You Really Know HER STORY? People have asked me why I chose to write about Saint Joan of Arc since it seems to some a departure from my normal American based writings. There is much that I can say about how the lessons learned from Saint Joan's life are very relevant to today's American citizen, but the real reason I wrote about her is ultimately much more personal. I find myself feeling similar to the way a great American writer from the nineteenth century felt. Mark Twain, after finishing his own biography about Saint Joan of Arc, said that: "Possibly the book may not sell, but that is nothing-it was written for love"
I originally intended to just publish Maid of Heaven at PoliticalPoet.com, but, since it turned out so much better than I ever dreamed possible, I decided a book would be the best way to share it with as many people as possible. I passionately believe that the history of Joan of Arc is one that everyone should study because the lessons to be learned from Joan's life are truly priceless and life changing. This website, MaidOfHeaven.com, was created to not only showcase the book it was named after but is also intended to be an online resource for anyone wanting to learn all about Joan and the amazing story of her life. 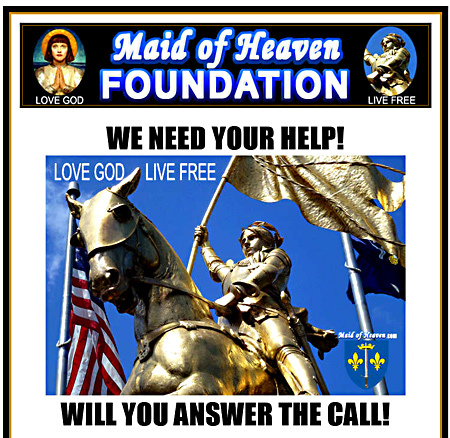 Whether you are just starting to learn about Joan or are already a scholar familiar with her history you should find both the book Maid of Heaven and MaidOfHeaven.com to be invaluable resources in your quest to learn all about Joan of Arc. It is my hope that Maid of Heaven will be a blessing to everyone's life in the same way that studying Saint Joan's life has been a great blessing to my own. Help Us To Teach More People About Joan of Arc! Learn more about Joan of Arc by going on a French Pilgrimage! Joan of Arc is one of the most remarkable people to ever live and her name is easily recognized by virtually everyone in the world today. Joan's life and history are also the best documented of anyone that has ever lived outside of modern times however most people are not aware of all that this simple young woman from a small town in eastern France accomplished in her life and death. Joan saved her people and united all of France by winning several important battles at Orleans and Patay in what is now known as the Hundred Years War. Joan completely reversed the course of this war and kept France from becoming a colony of England. 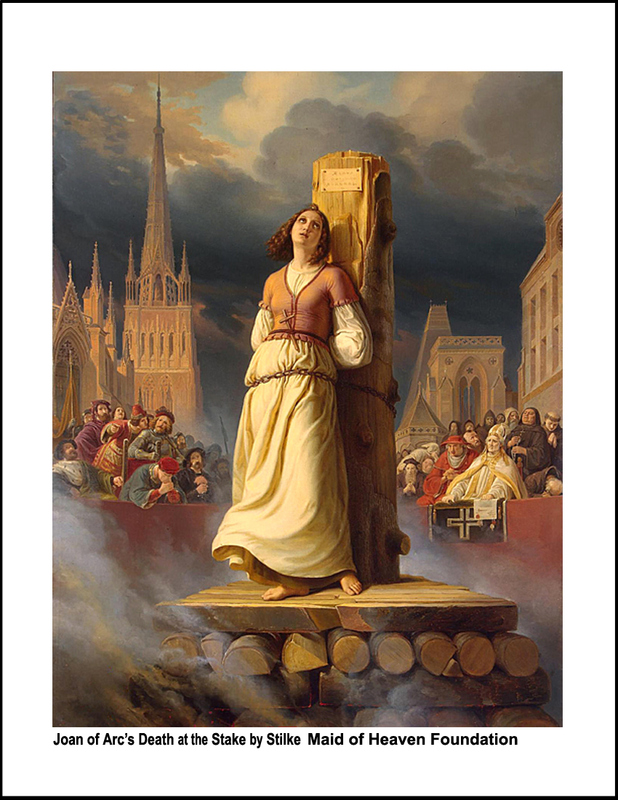 Greatly celebrated by her own people she was hated by the English who ultimately captured her and rigged a trial under the auspices of the Church to justify burning her at the stake. Twenty-five years later the illegality of her trial was revealed in another trial held by the Church that completely exonerated her and declared her a martyr. In 1920 Joan became an official Saint of the same Church that had once called her a heretic and executed her by burning her at the stake. She remains one of the most beloved figures in all of history. Joan of Arc Quick Facts gives the basic facts about Joan and is a great place to start. This page is one of the most popular pages at MaidOfHeaven.com because it provides the basic facts about Joan's life in an easy to read format containing relevant pictures to accentuate the understanding of Joan's life story. 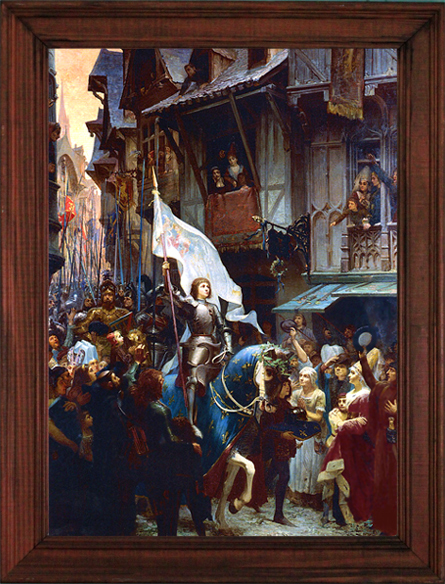 Joan of Arc Timeline is a very detailed timeline starting with Joan's birth in 1412 and covering the major events in her life and history up to her canonization in 1920. If you need to know exactly when and where Joan was on a particular day then this is the page for you. Joan of Arc Quotes is a very extensive list of quotes both by and about Joan. The best way to really know Joan and get a glimpse of her wonderful personality is by reading the famous words that she spoke while she was alive. Also contains some remarkable quotes about Joan by other historic personages. Long Biography and History Page contains a long list of resources related to the life of Joan. This page is designed to be a "Virtual Museum" containing links to facilitate learning on every aspect of Joan's life and history. If you want to learn every detail that you possible can about Joan then this is the page that can do the job. Joan of Arc's Faith discusses the incredible faith and love for God that Joan possessed. Includes many quotes demonstrating her faith both by Joan and by the people who knew her best. St. Joan of Arc: A Brilliantly Shining Light of God paper written by author Ben D. Kennedy about St. Joan to celebrate the 600th anniversary of her birthday. Good essay writing help is available here. References contains a long list of useful source materials for studying about Joan and also includes links to many free books available here at MaidOfHeaven.com and elsewhere on the Internet. Joan Of Arc FAQ's gives detailed answers to the most commonly asked questions about Joan and her life. This page is helpful when you have a question related to Joan that you have not been able to find the answer to anywhere else. Reviews of Books, Movies and Music will help you to find the best books and movies about Joan. In-depth reviews about many books and movies about Joan in terms of their historical accuracy. This page continues to expand as new reviews are written or become available so check back frequently for the latest. Historical Pictures and Paintings of Joan is the starting page to a very popular sequence of pictures containing historical artwork dedicated to Joan. Browse through the different artwork depicting Joan created by many of the renowned masters of art through the centuries since she lived. Contains paintings, sculptures, and other artistic interpretations. 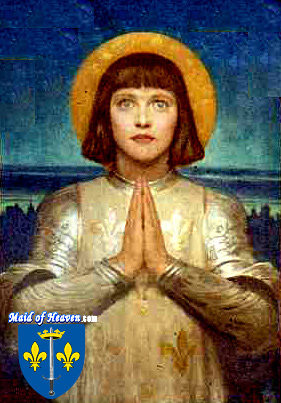 Joan of Arc Pictures and Artistic Representations contains a list of all the Joan artwork pages at MaidOfHeaven.com. If you are looking for a specific painting, sculpture or other artistic representations depicting Joan then you may find a link to it on this page. Saint Joan's Birthday celebrates the birth of Joan on Epiphany which was January 6, 1412. Joan was born in the small village of Domremy to Jacques d'Arc and his wife Isabelle and you can learn all about her birth and the significance of the day she was born on this page. Beatification contains a translation of the official pronouncement of Beatification as well as pictures and a description about Joan's Beatification ceremony of April 18, 1909. Very interesting to read the words of Pope Pius X describing the life of Joan and why she deserves the designation of Blessed. Canonization is a page about the official ceremony that took place at the Vatican on May 16, 1920 pronouncing Joan an official Saint of the Roman Catholic Church. On this historic occasion Pope Benedict XV described Joan as a "brilliantly shining light of the Church Triumphant" in his pronouncement. St. Joan's Feast Day is celebrated every May 30th on the anniversary of St. Joan's death. This page commemorates the day and explains the significance and contains eyewitness accounts of Joan's final moments and death by people who were there in Rouen on May 30, 1431. St. Therese and St. Joan of Arc explains Saint Therese of Lisieux's devotion to Saint Joan and contains her writings and some photographs of her dressed as Saint Joan that are amazing in several ways. Trial of Condemnation record translated by W.P. Barrett is the complete translation of Joan's trial and is an invaluable resource for serious students of Joan and especially for anyone wanting to know what Joan's trial was all about. In the pages documenting her trial you can read the actual words that Joan spoke as she tried to defend herself against the learned academics of her day. She amazed them with her words and continues to amaze people today with her wisdom and courage. Joan of Arc Links is a long list of websites available on the Internet containing information about Joan presented in a variety of interesting and informative ways. Even though you can find virtually anything and everything about Joan here at MaidOfHeaven.com there are still many quality sites dedicated to St. Joan that are well worth the visit. Free Movies and Videos about Joan of Arc contains a very long list of different types of videos related to Joan. One of the best is the full movie The Passion of Joan of Arc by Carl Dreyer which is one of the all time favorite movies about Joan. There are approximately a hundred movies and videos provided on this page so enjoy the viewing. Joan of Arc and her Scottish Knights explains the virtually unknown role played by Scottish soldiers in helping Joan to defeat the English. Contains a link to A Monk of Fife which is an excellent fictional account of Joan's life provided here online free. 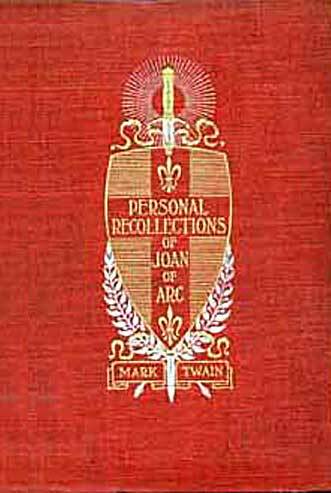 Mark Twain and Saint Joan explains Mark Twain's fascination with Joan that led to his great biography Personal Recollections of Joan of Arc. This page contains Mark Twain's essay on joan of arc as well as a link to the full book Personal Recollections of Joan of Arc that is available online here at MaidOfHeaven.com. 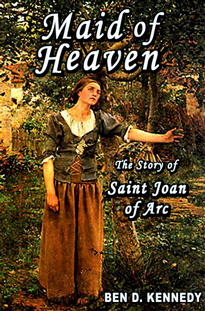 Joan of Arc's History for Kids All of the pages at MaidOfHeaven.com are suitable for kids to view however some can be rather challenging for young minds so this page contains specific resources designed to teach the history of Joan to youths including links to popular videos teaching her story. Joan of Arc History Visit this page for an even more exhaustive list containing every page at MaidOfHeaven.com devoted to teaching Joan's true and complete history. There are thousands of book equivalent pages and this index page will help you quickly and easily find the right information you are seeking. Joan Of Arc on Facebook page maintained by MaidOfHeaven.com is a chance to social network with Joan and interact. Joan of Arc Blog Ben's blog contains the latest happenings and news related to Joan and MaidOfHeaven.com and is updated regularly. Add yourself as a Follower and stay up to date. ADD Joan of Arc Featured Page of the Day Box ABOVE to Your Own Website! Please Consider Shopping With One of Our Generous Supporters! Copyright ©2007-2018 MaidOfHeaven.com All rights reserved.